RenewableEnergyWorld asked: Who uses the most renewable energy? It went on to answer that it depends on how you define it: Is it by kWh used, percent of use, on-site generation, long-term contracts, or all of the above. 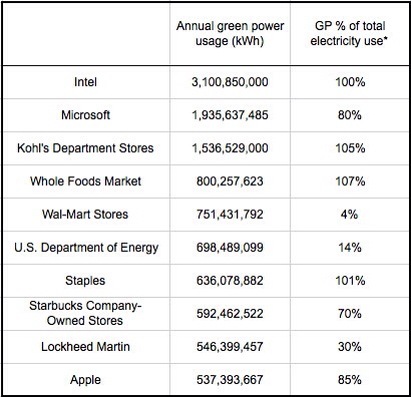 Top 10 annual users of Renewable Energy. The EPA defines "green power" as renewable energy sources with the highest environmental benefits: solar, wind, geothermal, biogas, some biomass, and low-impact small hydro. Large-scale hydro is not considered "green" as many of the large installations around the world have been responsible for large scale changes in all of the large rivers. In most cases ecology of the affected areas is totally changed for the worst.